Columbus Day winds to a close, a cold slows me down, but Tech at Night marches on somehow. You know what’s also marched on? The New York Stock Exchange’s website. The anarcho-terrorists of Anonymous promised to take that website down (note: just the website, not the actual trading computers). Well, they failed, unless you count a two minute outage as success. 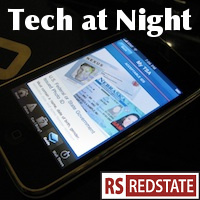 Heck, RedState pretty much goes down for about 5 minutes every night, and we’re not even trying. Speaking of security: in theory I love the idea of government focusing on government Internet security, while leaving the private sector alone. It doesn’t surprise me though if it turns out Obama’s brain trust can’t even do that right. Barack Obama’s disastrous regulatory record doesn’t suggest competence. Which is why Mary Bono Mack needs to drop her ongoing privacy investigations, because it can only lead to more power for the government online, and that won’t end well. Remember when I gave a little cheer for the supercommittee’s plans to auction off some spectrum? that plan is getting some criticism from people who want to keep some unlicensed spectrum free. If the spectrum can’t be put to use for high-speed Internet, then maybe it’s not worth bothering. If it can, though, let’s do it. We like to feel superior when we find out that Communist China censors the Internet, blocking websites based on content. Imagine if they wanted to do that here… oh wait, they do. It’s called the PROTECT IP bill. We must defeat it. We can’t really blame the telecom industry for rushing to the trough of the FCC’s planned Universal Service Fund reform. Free Money from the Government!!!!!!!1!!!!11!!1!!!! !one Instead, we need stop this tax and spend policy from getting that far. When the FCC talks about a fund, move your wallet to your back pocket, or cling all the more tightly to your purse. They’re coming for you. It’s not like wireless even needs subsidizing, what with active competition (one million iPhone 4Ses preordered on day one, Sprint accelerating adds of postpaid service), and great growth numbers via CTIA. Note that the USA has 56% of WiMAX users, and 90% of LTE users, meaning we’re the leaders of 4G wireless. We must keep government out of this. Yet Sprint Nextel, fearing competition even after doing its own merger to enhance competition, tries to bring government in further. Such short-sighted, selfish thinking. The Great American ABA Subsidy, aka modern patent law in America, continues to go round and round. Google and HTC team up to fight in the patent wars and Amazon, like the Millennium Falcon, becomes the fat new target for patent trolls to shoot at.